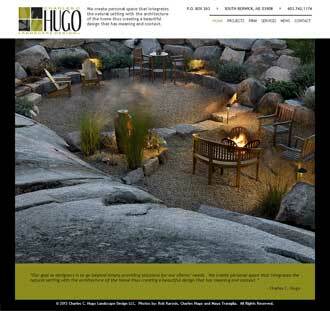 A business portfolio website for a landscape design firm in Rollinsford, NH. A landscape design company had an older WordPress site with a Flash animated home page. The home page would not display on iOS devices, such as iPhones and iPads, leading to a high bounce rate. iOS devices represented a significant portion of visits of potential customers for this client. The photographs of the landscape projects were too small. A list of keywords was provided to the client. The client wrote SEO content for the the site, including relevant captions for the landscape project images. The HTML for the site was optimized for search engines (SEO). An updated WordPress driven website was completed with a home page slide show that runs on iOS devices. Visitors to the site can now view a large portfolio of landscape projects on a wide variety of devices, from desktop to smartphone.